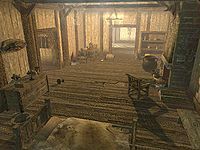 The Aretino Residence is a house in Windhelm owned by the Aretino family. After the death of Naalia Aretino, her son Aventus was sent to Honorhall Orphanage until his sixteenth birthday. However, Aventus ran away from the orphanage and returned home to perform the Black Sacrament. The house is found on the eastern side of Windhelm, above the Gray Quarter. The house is easy to spot, since its building has a curious shape, spanning over the road. It consists of one area, Aretino Residence. 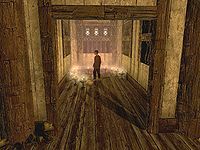 The front door opens to a set of stairs leading up, and you will hear Aventus Aretino chanting somewhere in the house. The first room is dimly lit and contains a non-respawning end table with some random books and a knocked-over bottle of wine on the floor. Along the southern wall sits a non-respawning dresser, with a bottle of alto wine and a non-respawning food sack on top. The neighboring room is lit up by numerous candles used by Aventus to perform the ritual. Next to the door is a respawning knapsack and a set of shelves with some lavender, a goat cheese wheel, a potion of minor magicka, and a small bowl with frost salts. Behind the shelves is a copy of the Destruction skill book A Hypothetical Treachery. Along the eastern wall is Aventus' owned bed and another non-respawning dresser with a bottle of alto wine on top. In the adjacent corner is a small dinner table with some food, a goat cheese wedge, a leg of goat, a salt pile, and a bottle of Nord mead. The unlit fireplace holds two pieces of firewood and a non-respawning pot. On the floor is a devastating letter written by Jorleif, the personal steward of Ulfric Stormcloak. In the southern alcove sits Aventus, chanting the Black Sacrement over and over, frustrated that the Night Mother doesn't hear his plea. For the ritual he has set up a number of candles, along with a chunk of human flesh and a human heart. The obligatory tome A Kiss, Sweet Mother lies next to him, with an iron dagger and a sample of nightshade on top. Talking to Aretino will trigger the Dark Brotherhood quest Innocence Lost. When you first approach the house, you will overhear a conversation between Idesa Sadri and Grimvar Cruel-Sea about Aventus Aretino. There is a "Danger" shadowmark on the bottom of the arch in front of the house. As the house is scripted to reset, it provides a supply of both human hearts and flesh. 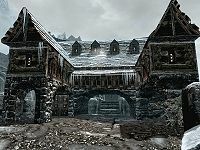 This issue has been addressed by version 1.2.4 of the Unofficial Skyrim Patch; it removes the ritual items but the house still respawns. After completing the quest Innocence Lost, Angrenor Once-Honored carries around a key to the Aretino Residence. He should have moved into the house after the quest, but the scripting is incomplete.